Primephonic launches hi-res streaming service | What Hi-Fi? The classical music specialist is adding another string to its bow - a streaming service to work alongside its download store. We're big fans of Primephonic's download store, awarding the classical music outfit a stellar five out of five in our review. And now it's launching its own hi-res streaming service to work alongside it. Like its download store, the service will offer nothing but classical music - a treat for fans of the genre. Every track will be available to stream as a 16-bit FLAC file (CD quality), meaning it should compete with Qobuz Sublime and Tidal Masters in terms of sound quality. 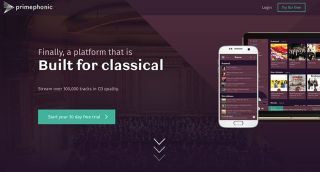 The streaming service will offer over 100,000 classical music pieces at launch, with hundreds more cuts being added over the summer from Warner Classics and Sony Classical catalogues. Primephonic also lists Naxos, Harmonia Mundi, Chandos, Bis and 2L as other labels it’s working with. The comprehensive search function we liked so much in the download store will be available for users on the streaming site. Subscription fees will be £15 per month ($15 in the US) – pretty sensible, considering classical album downloads cost about as much. A 30-day free trial is also being offered. The Primephonic streaming service is available now in the UK and US on a desktop streaming platform and mobile-optimised website, while an iOS app will follow shortly.